locals believe was given to the community in 1918. After reading it I asked myself a couple of questions. 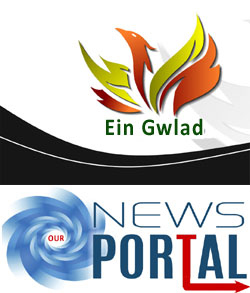 By what route did land in Gwynedd become the property of an organisation based in Swansea? But even if the YMCA owns the property, since when has this organisation been involved in property development? No obvious answers presented themselves so I made enquiries into YMCA Wales. a long time ago. 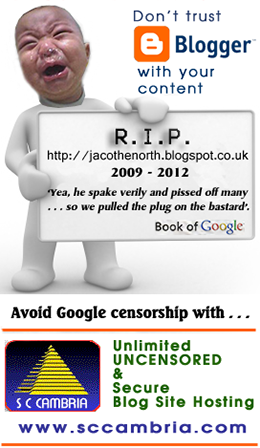 In fact, I get the impression that the website has not been updated for quite some time. The composition of the Trustees displays the same bias – one of them, Stephen Harrison, even lives in England. Another, Peter Joignant, is the man to see about “private housing development”. 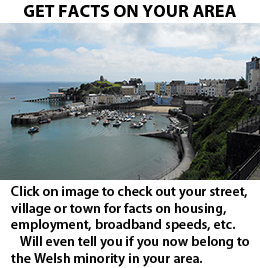 (Useful for projects like Penrhyndeudraeth.) Though in fairness, and in contrast to the Trustees named in the 2011 Report, the website suggests the YMCA has recruited a couple of indigenes to give some local colour. In addition, the YMCA has had the sense to use the old trick of having a Welsh figurehead, in the ample form of Sir Roger Jones OBE. So what does YMCA Wales do? Well, it does a lot of things. Some predictable, others not so, and some downright worrying. Let’s start with the holiday business . . . yes, I did say holiday business, outdoor pursuits to be exact. In 2006 the YMCA bought from the Youth Hostels Association Penycwm outdoor centre in Pembrokeshire. The first thing the YMCA did was change the name to ‘Newgale YMCA Outdoor Education Centre’. Predictably, this being the outdoor pursuit business in Wales, the staff at Newgale is almost all English. And to judge from the testimonials on page 10 of the 2011 Report those attending Newgale also come from England. Typical ‘Welsh’ tourism. The way in which Newgale is used reinforces the suspicion that YMCA ‘Wales’ is yet another Englandandwales outfit that uses Wales in a blatantly colonialist manner: to provide jobs for its English employees, holidays for English delinquents, housing for English criminals (see below) . 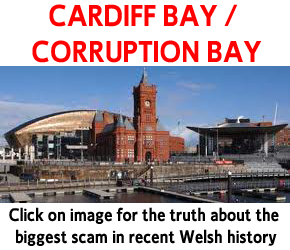 . . with much of this funded by the Welsh public purse. The suspicion of an England focus was strengthened by a reference on page 9 of the 2010/11 Report to Ofsted. This is the Office for Standards in Education . . . an England-only body. In Wales we have Estyn. Why would a supposedly Welsh organisation be quoting a body that only operates in England? Young tearaways from Wolverhampton enjoying themselves on the Pembrokeshire coast is bad enough, but I was more concerned to read “YMCA Wales has a partnership with East Jerusalem YMCA and Lebanon YMCA for the past three years”. (Report 2005/6.) What business is it of YMCA Wales to be sticking its nose in a very fraught political situation? Returning to Wales, my worst fears were confirmed when I read about the YMCA’s “partnership” with the National (Englandandwales) Probation Service. “We accommodate those with no local connection, have exhausted most supported housing projects due to their offending behaviour / support needs, and provide move-on from hostels to ensure continuity for those seeking bail or parole”. (Page 7, 2005/6 Report.) The only way to interpret this is that the YMCA is bringing dangerous criminals with no Welsh connections into Wales. Wales that they choose to affiliate to YMCA England? The bottom line is that most of those working for YMCA ‘Wales’ are Third Sector grant-grabbers who moved to Wales when they realised how much public funding was on offer. Claiming to help ‘young people’, the ‘homeless’, people with ‘problems’, etc., etc. In other words, duplicating the work of a dozen or more similar bodies claiming to do the same work with the same funding. Now that the ‘Welsh’ Government has been told by the EU that the next round of Structural Funds must not be wasted on the Third Sector, let us hope that the next few years sees these and all the other carpetbaggers making their way home. The YMCA Wales empire is – as you might expect – run from the YMCA building on Swansea’s Kingsway. This same building was home until very recently to Awema. 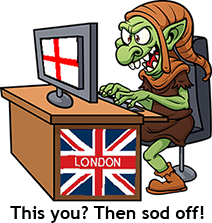 So how could the ever-alert Naz Malik, tireless campaigner against ‘racism’, not see the discrimination, exploitation, misuse of public funds, taking place under his very nose? O tempora! O mores! FOOTNOTE: I’m no nearer understanding what’s going on in Penrhyndeudraeth, but I know quite a bit more about YMCA ‘Wales’. And now, so do you. 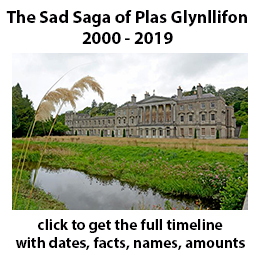 UPDATE July 9: I am indebted to Y Cneifiwr for directing me to the Charity Commission website, where he’d found the 2011/2 Report, lodged with the Commission on March 7th. (So why hasn’t it been put up on the YMCA Wales website?) I leave it to others, better qualified, to interpret it. Though one thing I did investigate was the Flint connection. YMCA Wales has just nine full-time employees. Two in Swansea, one in Cardiff, four at the Newgale YMCA Outdoor Education Centre in Pembrokeshire, and two in Flint. So what do they do in Flint? The answer seems to be that the YMCA is working with an evangelical church providing accommodation for (and doubtless proselytising to) the homeless of Merseyside. Though despite having only nine full-time staff and six part-time, the wage bill for 2011/12 came to £441,174, up from £413,185 in 2010/11 when there were more staff! Looking at the bigger picture, the YMCA is, as a comment to the original post says, a one-trick pony. Its only real asset, major income stream, and security for bank loan and overdraft, is the Newgale Centre. 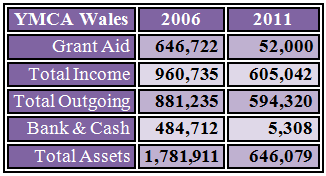 Other than that it relies on grants, mainly from the Welsh Government, and income from Probation and Bond schemes. So, like a few dozen other Third Sector outfits in Wales, the YMCA uses Welsh public funding to provide holidays for young English delinquents and accommodation for their criminal elders. It’s a good job Wales is a wealthy country, and can afford this generosity! A drastic reduction in cash held at the bank is not always an indication of financial difficulty. In 2006, it was possible to get up to 5% bank interest, but by 2011 interest rates on savings accounts fell to 0.5%. However, I would expect a corresponding increase in fixed assets, but this is not so. This has collapsed from £1.6m in 2006 to under £1m in 2011. You will also notice that they are currently financing operations on long term assets as the fluid assets is negative by £0.1m. In order to remain a going concern with this rate of reduction in net worth, £1.7m to £0.6m they will need to dispose of fixed assets. Failure to do so, at this rate of decline, without new capital injection, would result in insolvency by the end of this year. I also notice that they do not own any of the assets in affiliated branches. For example, the asset value of the Pontypridd YMCA building, £0.6m, now generously renovated by the council (Labour councillor is a director), would be in excess of the total vale of the Wales balance sheet. It would be interesting to see if the £0.8m fixed assets of “YMCA Wales” is wholly made up of the property in Pembrokeshire. The number is about right, which means that it’s a one trick pony, this would indicate the Penrhyndeudraeth development is just a speculative property development to fund the personal operating income of the trustees. If what you suggest is correct (and it certainly makes sense), then it helps explain why YMCA Wales is desperate to build open market housing in Gwynedd. It might also explain the late appearance of the 2011/2 Report. We can also safely assume that YMCA Wales is looking for funding from other quarters, including perhaps the Welsh Government. And if those running YMCA Wales have brought it to the point of bankruptcy, who has the power to remove them? Trustees? Affiliated Associations? YMCA England? A reason for the delay in publishing the annual accounts of Wales YMCA is could be legal, in the form of uncrystalised transactions/contracts, something like selling the property and a lease back agreement. Of course, YMCA in Cardiff is doing very well and operate properties as a Housing Association, with over £1m cash in the bank. I have found an outfit specialising in “social work without accommodation” at City Road London EC1V 2NP called Y Care International Limited and an outfit apecialising in “social work with accommodation” at J-Shed, Kings Road, Swansea, SA1 8PL called Lifted (Cymru) Limited, and an outfit specialising in “other service activities” called The National Council of YMCA’s Wales Trading Coumpany Limited, and an outfit specialising in “social work without accommodation” at The White House, Pen-y-Cwm, Haverfordwest, Pembrokeshire, SA62 6LA under a company name of The Young MensChristian Association of Wales(Incorporated) Limited, which just happens to be the same premises of Newgale YMCA Outdoor Education Centre. All of these has a director of Ms Maureen Sykes, who lives at 10 Richmond Road, Uplands. Is this person related to Mr Mo Sykes, also of 10 Richmond Road, Uplands who’s a trustee of YMCA Cardiff Housing Association? Lifted (Cymru) was dissolved in August 2009. 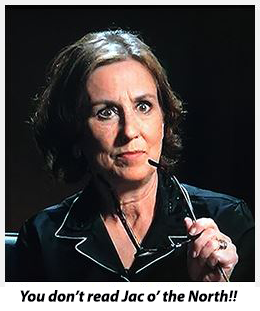 The Maureen Patricia Sykes of Lifted is the Mo Sykes who crops up elsewhere. The 2011/2 Report has come to light on the Charity Commission website. It bears out your remark about YMCA Cymru being ‘a one-trick pony’. Without the outdoor centre in Pembrokeshire it would be in real trouble. I should have checked the Charity Commission. I note that it reached the CC on March 7, so the YMCA has had four months to get it up on their website. Will have a look through it now. An analysis from anyone better qualified than me would be welcome. Diolch. Director number 911450009 is listed under the name of Mr Mo Sykes. Director number 908634884 is listed under the name of Ms Maureen Patricia Sykes. Both share the same Uplands address in Swansea. I assume Mo is a transsexual. The historical Swansea companies appear to be prospecting activity before landing at Brawdy. The houses are worth £850k. The 2012 balance sheet shows they owe £230k to suppliers, have £83k outstanding from customers, £8k in the bank, and a £1k loan. So their net current liability is £141k which cannot be financed by current activity. Other than the property, in fixed assets they have £141k ‘investments’, coincidently the same amount, which suggests this company is operating as a branch/vehicle of something else. Looking at the 2011/2 Report for the Cardiff YMCA Housing Association ‘Mo Sykes’ is there as a representative of YMCA Wales. I think any reference elsewhere to a ‘Mr Mo Sykes’ is just a typo or someone thinking it’s an abbreviation of Morris or some other name. I’m more interested in the £141,000 suggesting “this company is operating as a branch / vehicle of something else”. Could you please explain. So what does YMCA Wales do? They got a charity shop here in Caergybi/Holyhead in what was the Woolworths shop. Is vastly overpriced considering what it is and never has anyone in it. The £141k in ‘Fixed Asset Investments’ is made up of ‘securities’. This is stuff the company owns long term, which is not land or property or fixtures and fittings. It would usually be made up of units of investment in financial institutions. It liberated a mere £1k in dividends. This outfit is not large enough to manage these unit funds themselves, like YMCA England, so it’s probably managed for them. It could be a notional amount which is the ‘Wales share’ of the securities now managed by YMCA England, or more cynically, a slice of the securities portfolio YMCA England has donated to Wales to maintain a Welsh footprint. The only way to find out is to ask them. Under Fixed Assets, securities as an investment always have to be listed separately from physicals such as land and buildings. There is £214k in the form of a bank loan is secured against the property in Pembrokeshire, so they don’t own it outright and have obtained a further £100k overdraft provision from the bank on the same basis. Incidentally, you will see they lent someone £35k as a mortgage for land or property but have made a ‘provision’ for the same amount. This is very strange. Perhaps they don’t know who owns the title to the property they are financing, or don’t expect the money back due to a bum deal. This could be the Penrhyndeudraeth plot. Daft question – Regardless of the strange financial arrangement, why do the good people of Penrhyndeudraeth want to house homeless vulnerables on probation from Wolverhampton opposite their school ? As ever, you provide valuable insights, Brychan. Though the £35k mortgage loan is strange. 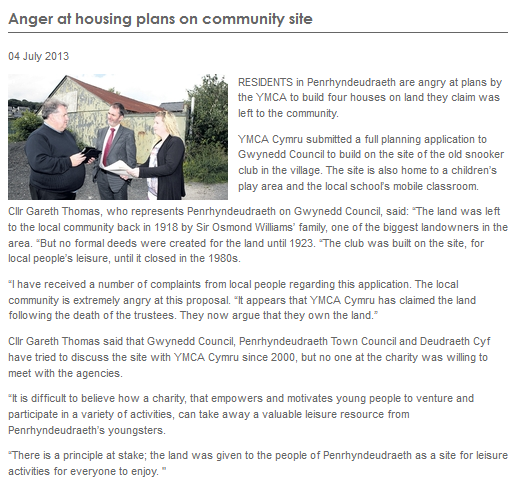 In the Cambrian News article YMCA Wales claims to “own” the land, presumably outright. Unless the mortgage is to cover the new build? But to whom would the mortgage loan have been made if YMCA Wales claims to own the land? Then there’s the issue of what kind of accommodation is planned. Local councillor Gareth Thomas is quoted in the article as saying ” . . . houses to be built to sell on the open market so YMCA can profit from them”. But he also talks of ” . . . the rest of the site”. So there may be room for the kind of places – and tenants – you talk of. Elsewhere Cllr. Thomas says the YMCA claimed the land following the deaths of the Trustees! Can this be right? Can anyone search out land or property with no Deeds or no registered owner and just claim it? If so, then it’s the behaviour of vultures. Though if it has been used as a community asset for almost a century doesn’t this bestow rights of ownership on the community? The huge area of land next to this proposed development was converted into a ‘community park’ and the football pitch right next to it formed part of this. It was a change of use from rough pasture. It was part of planning application C01M/0062/08/LL. The planning applicant for this was Siop Dewi. Then my alarm bells my went off. Siop Dewi, in Penrhyndeudraeth was run by Cllr Dewi Lewis.of Plaid. He resigned in 2011, after admitting stealing cash from the post office which was part of this shop. His project didn’t include the patch of land now in question, but back in 2001 when the ‘community park’ was set up, there was access across it, and it boasted a tin shack type hall according to the old plans. I suspect this hall was religious in nature and belonged to a local chapel. How it fell into, alleged YMCA hands, I don’t know. Just the other side of the school, is a chapel, and car park which may have owned the land from the time the chapel was built, hence it’s longstanding community use. Capel Fron, may be the chapel in question. It is the evangelical outfit in Penrhyndeudraeth and the new leader there is Pastor Pete Campbell. He was ordained there by Pastor Pete Day, last year. This Pete (Day) is from the Baptist church in Southport, Merseyside. Following the theory that they all are called Pete, I discovered that the outfit Y Cneifiwr identified, was set up by Pastor Pete (Cunningham) who’s ministry is, coincidently, also in Southport, Merseyside. He is director of Green Pastures – Releasing the Church to End Homelessness, who are involved in the YMCA stuff in Fflint. Surprisingly, Green Pastures are licensed by the FSA to trade in securities, although I don’t know how many homeless people trade in hedge funds. There is the possibility that YMCA has acquired the whole site, the tin shack bit as well as all the ‘community park’. They may have only applied for planning permission to build on a small part of it because it contained an existing building. More to follow. “No formal deed were created until 1923”. This would have happened due to the Welsh Church Act 1914 (delayed due to WW1). It came into force in 1920, but it took a few years to formally settle all land titles as the Church in Wales kept all of it’s buildings and consecrated land. Land donated and held in trust, not consecrated, may have passed eventually to a non-conformist chapel by agreement, it having been donated for such a purpose by a benefactor, in this case Sir Osmond Williams. This date is of significance as such a trust arrangement from the 1914 Act would be 99years. It’s now 2013. I don’t think the trustee died, I think Sir Osmond Williams died, in 1927, and the trustee arrangement may have expired. Let me see if I understand all this . . .
You are suggesting that the land in Penrhyndeudraeth belongs to this evangelical church with links to Merseyside and the Green Pastures scheme in Flint? So is the church trying to keep the locals off its back by getting the YMCA to put in the planning application? Would this explain the £141k? But if the land is owned by the church where does this leave the £35k mortgage loan? Strange you should mention Y Cneifiwr, he’s been keeping tabs on another bunch of very materialistic evangelicals down in Carmarthen. Small world, innit! The business plan of ‘Green Pastures’ outfit is to obtain ‘partners’, as a joint venture operation with an evangelical church. Partners then “help us to house homeless people in properties identified by the Partners and purchased by Green Pastures on their behalf. Partners look after the homeless and poor as well as the properties concerned. They form active teams that care for the homeless and poor in their area.” – The Well Christian Centre, Bridgend. Green Pastures get to own a huge property portfolio, which they obtain rental income from occupants who, by their nature, would be on state benefits. It may also be the case that desperate vulnerable people with financial problems are easy targets for the God Squad, who are only to glad to relieve them of their mortgage arrears on their homes. It appears Green Pastures need a license from the FSA in order to raise venture capital to finance it, but no doubt the returns are very high. The advantage of this type of operation is their local base, is free, in the form of a local chapel, which they can get third/public sector grants to do up, under the guise of public amenity, like bowling alley or football pitch. Also useful, is doing the difficult bit of administering difficult tenants in the acquired properties can be done for them, usually by an ‘outreach worker’ of a local authority. The use of the word ‘partners’ is interesting. A joint venture means they can eventually buy out the remaining share, once the grants have been creamed, or use this to expand the operation geographically (but if there is a vertical structure it would constitute a pyramid scheme). If Green Pastures do have a foothold in Penrhyndeudraeth, as they evidently now have in Bridgend, Mold and Fflint, I wonder if YMCA Wales is a victim or a willing participant in this? The YMCA should come clean on what is does or doesn’t own, provide title deeds, and what portion of a defunct trust, at least to the Welsh Government, to ensure their is good propriety in what they are doing. I think I need to sit back, work out what we’ve got now, and the likely connections, then bring it all together in a fresh post. It now looks a lot more complicated than YMCA Wales building houses in a north Wales village. In the financial statement 2012 you will see a loan to Rhayader YMCA in 2012. Further investigation found that Rhayader YMCA (Charity number 1115833, now wound up) is no longer an affiliated branch. It was merged into YMCA Wales on 01/08/2012. All funds and assets were transferred to YMCA Wales (Charity number 512259), the Newgale operation, on 14/08/2012. As the Rhayader premises, Dolgerddon Hall, is a substantial detached property, I would have expected to see a significant jump in the property value listed under fixed assets as at year end, in the balance sheet of YMCA Wales. This is not so. Which either means that Rhayadr YMCA did not own the building, or it has been disposed of by transfer to somewhere else. The mortgage liabilities amounting to £214k and the £100k overdraft facility of YMCA Wales is secured upon the Newgale property alone, and is listed as such, so does not relate to any debt inherited on Dolgerddon Hall. Curious. Very curious, but where does it take us? I was curious to know why this pyramid outfit from Merseyside plumped for Bridgend for it’s expansion into South Wales. Bridgend is not exactly the poorest part of the valleys, and you can pick up a chapel further up the valleys at a tidy snip. So I decided to investigate. I found that Bridgend YMCA had a bit of a breakdown in 2010, and disposed of it’s property assets, selling then to Hendre Housing Association for £425k, on the basis they can continue to live in the building for free. This arrangement happened at the same time Green Pastures started operating out of the nearby Pentecostal happy clappy church, branded ‘The Well Christian Centre’. 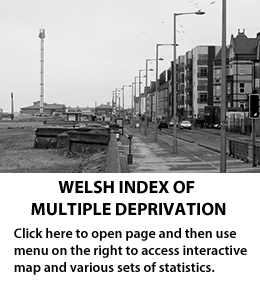 This makes sense, as any ‘homeless’ people, which in Bridgend is defined as a person too difficult to house by a properly registered social landlord like Hendre, or someone who doesn’t qualify for housing like from outside the area, or ex-convicts, drug addicts or persons of unsound mind can be accommodated by the Green pastures outfit with a ready supply of venture capital homes. YMCA and Hendre effectively act as agents for these ‘homeless’. I then discovered that there are some useful trustees now at YMCA Bridgend, including a ‘keep the riff raff away’ councillor at Brackla, and a Consultant Community Paediatrician at Princess of Wales Hospital, who also happens to be the Associate Clinician for Abertawe Bro Morgannwg Health Board, responsible for child protection. Nice partnership. Access to all the problem families. I don’t know if this will save an A&E department locally, but the Green Pastures outfit claim to heal people with babbling tongues through spiritual intervention. A loan of £7k (interest free) from YMCA Wales must have been very useful for the new youth counselling service. Depressed and desperate? 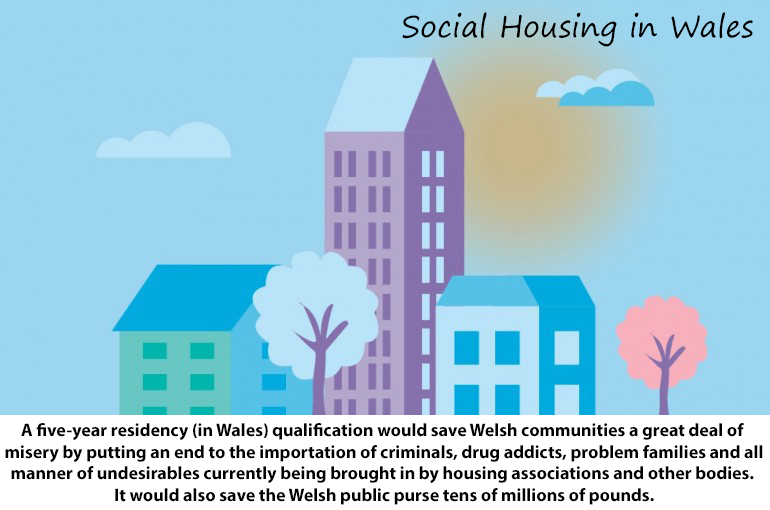 If you don’t qualify for admission to Hafod Care Centre, operated by, you guessed it Hendre who now own the YMCA property, they can get you a flat via Green Pastures and invoice the health board as well as take a chunk of your housing benefit. It is, unquestionably, a racket. The more evidence that surfaces, the clearer this becomes. My goodness, I was not aware that a non-denominational Christian charity established in 1844 was such a sinister organisation. Wow what a service you are providing with your ‘right of centre’ analysis! Thank goodness facts do not get in your way! Maybe you should reveal your own location, interests. I.e .’do unto others’. Any how if you serious ly think you have evidence of malpractice within a charity such as YMCA Wales, then take it to the Charity Commision. I suspect you will not because the is the most ilinformed, rubbish I have ever read. YMCA Wales has a long history since 2002 of closing sites to fund the operations of the HQ.